Keeping alive traditional resist dyeing techniques to create these one-of-a-kind scarves. Dyed by hand to ensure consistency and quality in each design, giving value to the story behind the pattern. 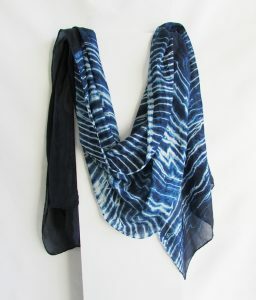 Hand-dyed shibori patterned long scarf, beautifully soft and comfortable as it is distinctive. 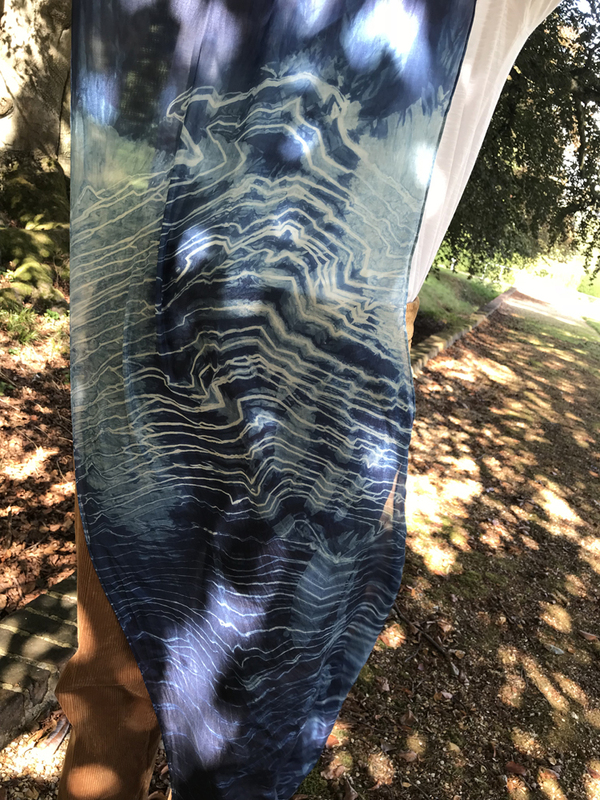 This stunning pattern has been hand-dyed by using the resist dying technique, known as shibori. Reviving traditional shibori craftmanship that embodies elegance and opulence so that you can make even the most understated outfit look luxuriously breath taking with this silk scarf. Crafted from luxuriously lovely silk. There are endless ways to wear a scarf like this. Each silk scarf has an eye catching shibori pattern that will wrap you in glamour. Hand crafted by Lisa in her studio in Hertfordshire on the edge of London. Keeping alive traditional resist dyeing techniques to create these one-of-a-kind scarves. Dyed by hand to ensure consistency and quality in each design, giving value to the story behind the design. Light weight elegant 100% pure silk. Hand-dyed in natural indigo, please allow for slight variation of tones in indigo.  The dye that comes from the Indigofera tinctura plant is one of the oldest natural dyes known to man. Using indigo to achieve this navy scarf is a labour intensive process – fabric is dipped and then dipped again to achieve the deep blue hues you see. Current order processing time for this scarf is 1-3 days. I am creating them as quickly as possible. Once your order has been made I will contact you and give an accurate update on your order time. Each scarf is hand-dyed and made with love and time in England.